Each month the Blog Ambassadors and I have a focus topic. Something we think about through out our days with our children and then write about. We didn't have one yet for February so I asked our fearless leader for some ideas. Leslie, is the CEO of Mother Goose Time and continuously blows me away. These are her words. With a focus on social-emotional development, how do we create a warm and safe environment even when our children are feeling tired, stressed and maybe even a bit out of control? How do we model empathy for others who are different than ourselves… or maybe even just have a different idea than we do. How do we practice taking care of others and stopping what we are doing to lend a helping hand? At the core of all learning is a healthy and loving relationships, how do we keep this in perspective when doing a math activity, reading a book, tracing letters or making an art project? I hope you don't mind, but I would like to pull out some of the questions from above and write down my thoughts so far. First, how do I create a warm and safe environment even when my children are feeling tired, stressed and maybe even a bit out of control? I think this starts with a good cup of coffee and a prayer. :) Well that's my funny answer, but I think it's kind of true. Every single one of us wakes up on the wrong side of the bed from time to time. Children and Moms included. The first thing I can do as the teacher/mom is to recognize that in myself. Often, what snaps me out of it is to just take a minute "to myself", I put that in quotes because you know if you are a Mom that never happens, so it's more of an internal moment to myself. I take a deep breath, literally, and put on praise music on Pandora. It's seems silly, but it always works to lift me out of a bad mood. I really think the main way to create a warm and safe environment is by being in a good place mentally and emotionally as the teacher because it is certainly not just about the pillows and the posters on the wall! Having a routine yet being open to change is also important. That way, when your child is having a bad day, if they are tired, or out of control, you can take a break and come back to it or you can try to approach the learning in a new way. Play a game, which they learn from, cuddle up and read a book, which they learn from. If too much energy is the culprit go outside and play or have them stand and wiggle while they learn. As far as the stressed category. If a child is feeling stressed, how can you make them feel safe? I run into this a lot with Lachlan. He is really hard on himself and wants to know everything with out being taught. When we get into these moments, we can pause, give him some time to calm down and come back to it. Sometimes all he needs is reassurance. It always makes him feel better to know that when Mommy and Daddy were young they didn't know how to do ___________ and the only reason we know now is because someone taught us. I think getting to know the child you are working with is key to making the environment feel safe to them. It will most likely look a little different for each child. How do we practice taking care of others and stopping what we are doing to lend a helping hand? 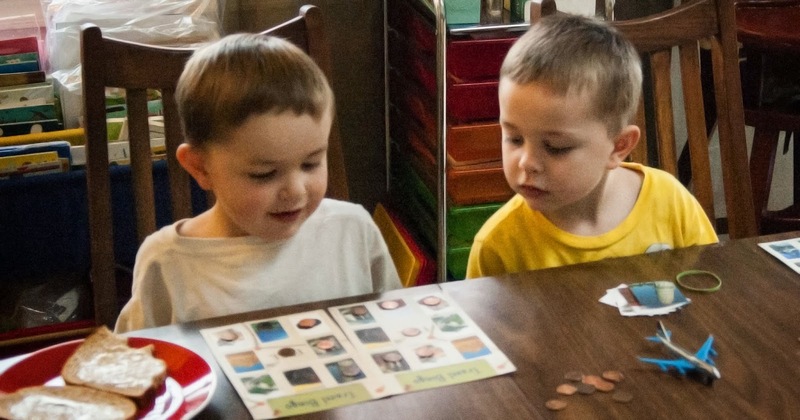 I love that helping others is one of the 33 skills that Mother Goose Time includes in their curriculum and looks for in their assessment tools. I need to look for this more often through out our day. But a few days ago I caught a good example of a moment like this. Lachlan and Peter were playing travel BINGO. Lachlan was the caller while I cleaned up from the meal. I turned to see Lachlan looking over to Peter's cards to make sure he didn't miss marking a picture. It was so wonderful to see and I of course took the opportunity to thank Lachlan for looking out for his younger brother. Not to worry, the next moment they were fighting over a toy, they are brothers. But I appreciate this topic being in focus for us Blog Ambassadors this month because I was able to really see this moment and cherish it. While trying to think about how we teach our children to help others I couldn't help but settle on our faith as being a big contributing factor. Not just in teaching them about what we believe but by also attempting to act it out in everyday life. We were just recently learning about the Good Samaritan. We talked about what we should do if we see someone in need or hurt. Then, just this weekend, Lachlan was outside riding his scooter. Along came some older boys soaring along on their scooters. Lachlan, trying to be like the big kids, tried to keep up. He took off, flying just as fast as he could. All of a sudden he hit a bump in the sidewalk and down he crashed. Jeff was out there and helped him up and brought him in. Lachlan was telling me the story and with tears in his eyes said "And Mom, those boys didn't stop to help me or anything." Oh my goodness, I felt his sadness in that moment. It hurt my heart so much. He could not understand how those boys could see someone get hurt and not stop to help. I have to say, although sad, I did walk away from that moment in a small way, proud. After all, he knew that stopping to help was the right thing to do. I hope through our teaching and through our actions our children can continue to learn kindness. To me kindness, security in their family and a strong self concept are priority lessons for my children to learn at this point in their lives. The ABCs and 123s can wait!